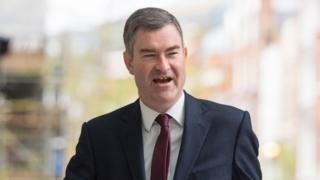 It would not be "sustainable" to ignore MPs if they vote for a softer Brexit, Justice Secretary David Gauke has said. On Monday, Parliament will hold an indicative vote on Brexit alternatives. A customs union with the EU is thought to be the most likely preference. Meanwhile, the prime minister is considering her next move after her plan was defeated for a third time. European Commission President Jean-Claude Juncker said on Sunday that patience was running out with the UK. In an Italian television interview, Mr Juncker said that the EU wanted to see MPs reach an agreement about the terms of the UK's departure in the coming hours and days. What are MPs voting on? Mr Gauke said there are "no ideal choices" over the Brexit deadlock. Speaking on the BBC's Andrew Marr Show, he argued the prime minister's deal was "the best outcome". But he added: "Sometimes you do have to accept your second or third choice to avoid an outcome you consider to be even worse." Labour's deputy leader Tom Watson said it would be "inconceivable" if there was a general election and his party did not include a new referendum in its manifesto. Following the UK's vote to leave the EU in 2016, Theresa May negotiated a withdrawal deal with the EU. Although European leaders agreed to the plan, Mrs May has yet to get the deal approved by Parliament. The prime minister has until 12 April to seek a longer extension to the Article 50 process if the UK is to avoid leaving without a deal. The prime minister's deal is currently opposed by parties including Northern Ireland's DUP - which the government relies upon for support - as well as a group of her own MPs. However he admitted deciding to vote for it on Thursday before being talked out of it by friends. On Monday, MPs have a non-binding vote on a series of options designed to test the will of Parliament. The intention is to see what outcome, if any, commands a majority. None of MPs' eight proposed options secured a majority in the first set of indicative votes on 27 March, but those which received the most were a customs union with the EU and a referendum on any deal. A customs union would allow businesses to move goods around the EU without tariffs, ie taxes - but membership would bar the UK from striking independent trade deals after Brexit. Why is the customs union so important? What is the 'no deal' WTO option? How can Article 50 be extended? Would no deal mean the return of direct rule in NI? Mr Gauke said he was in favour of leaving the customs union, arguing that it would "better reflect the way the country voted in 2016". Membership of a customs union would breach the Conservative's 2017 manifesto. But he acknowledged that his party "does not have the votes to get its manifesto position through the House of Commons at the moment". "We are in an environment where it is not just about going for your first choice," he added. Defence Minister Tobias Ellwood told Radio 4's The World This Weekend he would support something along the lines of customs union membership - if the prime minister's deal could not get through Parliament. "I fear that is the only option we have if we want to honour the referendum" he said. Mr Gauke reiterated his opposition to a no-deal Brexit, warning he would leave government if such a policy was pursued. A no-deal Brexit would mean cutting ties with the European Union immediately and defaulting to World Trade Organisation rules for trade. Tom Watson said there was an "emerging consensus" among Labour MPs. He said: "Whatever the deal looks like - and we understand there has to be compromises - if it's underpinned by a People's Vote that is the way we can bring the country back together." Speaking on Sky News, shadow foreign secretary Emily Thornberry said under a Labour government it was "likely" that the UK would leave the European Union. When asked if Labour was a Remain party, Ms Thornberry replied: "In our hearts we want to remain but we have to square that with democracy. "If the people want us to leave we have to leave." Ms Thornberry also said "it looks like the time may come" for another attempted no confidence vote in the government. If passed, this would pave the way for a general election. The deputy chairman of the Conservative Party, James Cleverly, told Sky News that his party is doing "sensible pragmatic planning" in case there is a snap general election, but not seeking to call one. And Mr Gauke warned he did not see how a general election would solve the current deadlock. Former Conservative prime minister John Major said: "When feelings are running high... a general election is pretty much the very last thing we need." But he added: "We might be driven to it later." If an election failed to produce a majority in the Commons, Sir John suggested a "time limited" national unity government should be formed. He said: "I think it would be in the national interest to have a cross-party government so we can take decisions without the chaos that we're seeing in Parliament at the moment where every possible alternative is rejected." "I don't think it is ideal, I would prefer a Conservative government with a clear majority." But he argued such a government would at least enable decisions to be taken. Brexit: What alternative plans did MPs vote on?